We will do our best to turn any less than satisfactory experience into a positive one. There's no better way to make restaurant-style pizza at home than with this premium baking stone. Exclusive design guarantees the ideal crispy crust, every time. 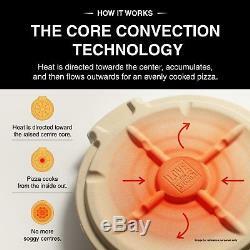 Looking for that restaurant-style pizza flavour at home? 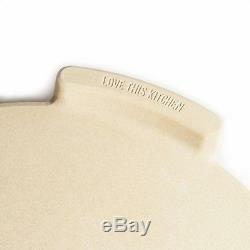 Achieve it with the Square Bread & Pizza Cooking Stone by Love This Kitchen! Our 40cm Ultimate Round Pizza Stone is thicker than other brands so it retains heat better a must for a perfectly baked pie! PLUS, our proprietary Core Convection Technology projects heat inwards to ensure an evenly cooked, crispy crust that will have your family's mouths watering! No more gross, soggy centre. We've added a patent-pending "no-slip" pizza stopper feature on one side of the stone to prevent the pie from sliding off when you remove it from the oven. Look, if you want pizza that rivals the best restaurant pizza, you need a high-quality stone. Makes a great housewarming, shower, or wedding gift, too! 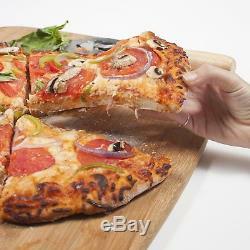 - NO MORE BROKEN STONES - The #1 complaint about pizza stones is that they break after a few uses. Our proprietary, FDA approved, ThermaShockTM Cordierite is designed to withstand up to 815 degrees and ensures a worry-free cooking, as our stone will not break due to temperature changes (and is covered by our Limited Lifetime Guarantee). Our exclusive Core Convection TechnologyTM cooks from the centre out for an evenly cooked, delectably crispy crust with no soggy centres, for years to come! - MORE SPACE = BETTER COOKING - This stone offers an ideal baking and grilling surface of 41x35cm. You can cook two personal-size pizzas side by side, bake loafs of bread or larger batches of cookies, as you can distribute them evenly through the whole surface. This stone has been tested at high temperatures by our customers on Kamado Joe, Weber, Traeger, Big Green Egg and many other Commercial & Professional, Charcoal or Gas BBQ Grills - THE PERFECT THICKNESS - At 2cm thick (average), our stone's superior engineering provides greater heat retention than thinner brands and is less prone to breakage; its bottom has an all-around ledge, making it easier to handle this 3,6kg stone. Even though it has a bigger surface area, it adapts to smaller ovens, using their space in the best possible way. 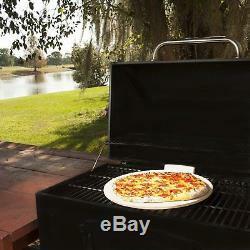 Check that your oven is at least 41cm deep before purchasing. 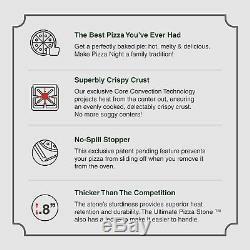 NO MORE SPILLS OR SPOILED PIZZAS - Our patent-pending no-spill stopper, not available on any other pizza stones, prevents pie from sliding off the back when you remove it from the stone for a no-spill worry free home pizza cooking experience. We even show you how! 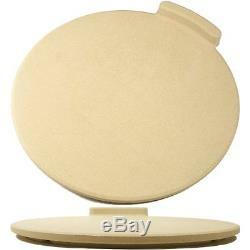 An instructions manual and a complete online Video Tutorial are included. It's So Easy to Make Pizza Night a Family Tradition! - LIMITED LIFETIME GUARANTEE - At Love This KitchenÂ®, we take everyday tools and redesign them to make them better, stylish, and enjoyable. By using only the best materials and implementing a rigorous quality control process, we create top of the line products: practical kitchen tools made to last. 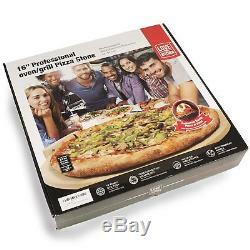 The Ultimate 40,6 cm Round Pizza Stone, for Cooking & Baking on Oven & Grill. 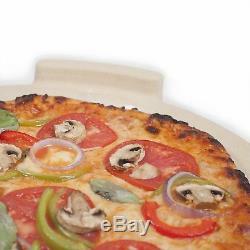 The item "The Ultimate 40,6 cm Round Pizza Stone, for Cooking & Baking on Oven & Grill. &" is in sale since Monday, March 5, 2018. 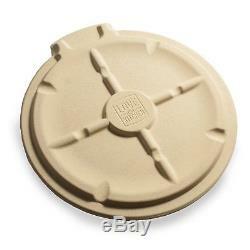 This item is in the category "Home, Furniture & DIY\Cookware, Dining & Bar\Bakeware & Ovenware\Baking Trays". The seller is "lyon-palace" and is located in Manchester.